cloudstorage | Unity and Ubuntu – Tweaks you must know! If I said you could have 5 GB of online storage for free, with the option to earn a bit extra by persuading others to sign up; be able to share you files publicly, and could sync files straight from the Ubuntu desktop – what would you say? Copy, a relatively new entry into the ‘cloud storage’ service arena, has a very apt name. Aside from supporting Linux out of the box from day dot the rest of its offerings are, sadly, fairly predictable. Services like Copy are fast becoming to cloud storage what the ‘netbook’ became to the PC sector: great implementations that all look a bit different, but offering little in the way of differentiation where it matters. Same old, same old. Its “social referral” offer – whereby you convince someone else to sign up using a special link – is actually really generous (see chart at bottom of post) in comparison to its rivals. Copy gets points for that. On the ‘cons’ side the privacy and security policies safeguarding your data aren’t quite as robust as competitors; it can’t auto-sync; and the app gives no indication/notification that a file has completed syncing. 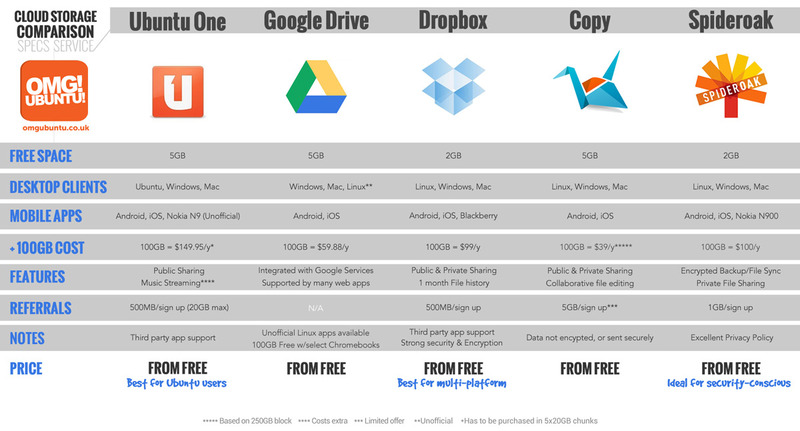 Tl;dr: If you’re already using Dropbox, Ubuntu One or Google Drive you aren’t missing out on much by not switching. At least not yet. Copy offers 5GB of storage for free (in return for an e-mail address). Desktop apps are available for Linux, Mac, Windows, Android and iOS. You can find out more, sign up for an account, and download the Linux app by hitting the button below. This entry was posted in App, cloud storage, cloudstorage, copy, News, Review on April 2, 2013 by unityadmin.